In the past 10–12 years there have been many articles addressing issues in the living/dying process that accompanies the final phase of life. Many of them deal with hospice care — a specialized care for the terminally ill and their significant others. Some controversy surrounding this type of care arises from (1) the difficulty of scientifically evaluating significant qualities such as enthusiasm, devotion, caring and frankness (in discussing death) and (2) the ambiguity and inconsistency of human reactions to dying. Nevertheless the rapid growth of this service suggests that previously ignored needs are now being addressed. 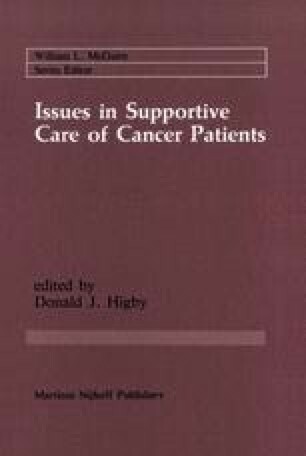 This chapter seeks to offer the reader a brief background on the concept of hospice and the variety of facilities available, the importance of understanding the psychosocial needs of patients and their families, guidelines for physicians caring for the terminally ill and some evaluation research findings.